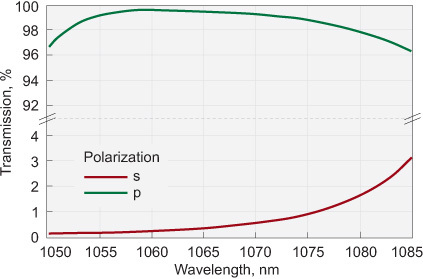 Thin Film Laser Polarizers (Rectangular) provide the achievement of strictly linear polarization of laser radiation and utilise the polarization which occurs on reflection from a plane surface. Thin Film Polarizers are used in high energy lasers. They can be used as extracavity attenuators for Nd:YAG laser fundamental and its harmonics or intracavity Q-switch hold-off polarizers. The most efficient way to use thin film polarizers is at Brewster angle – 56°±2° with minimal losses. Typical polarization ratio Tp/Ts is 200:1. We provide Thin Film Laser Polarizers with Tp>99% under customer request.